Last Friday a mystery parcel dropped through my letter box and I was surprised to discover that it was the Birchbox Loves February 2015 box*. The reason this came through my letter box is because Birchbox has now launched a Slimbox, which as you've probably guessed by now is slim enough to fit through a standard letter box. If you'd like to read more about the Slimbox you can find my post here. 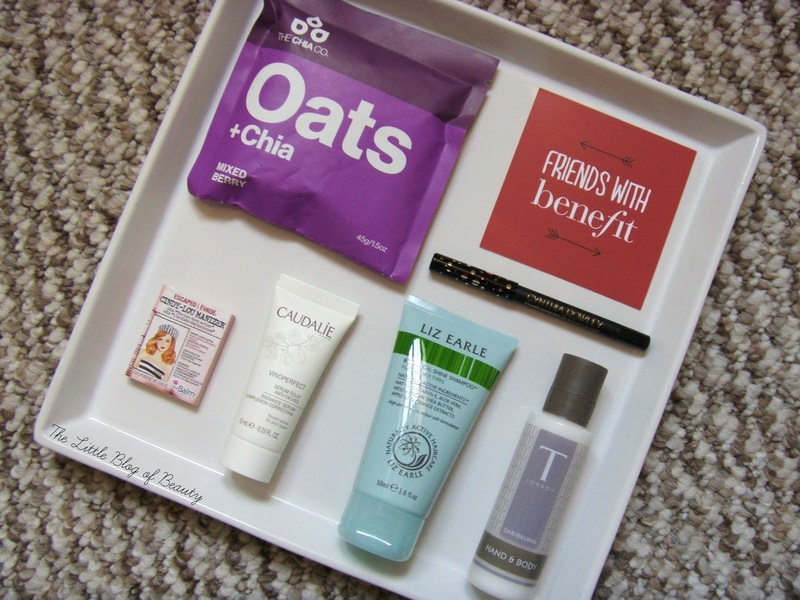 For me Birchbox is definitely one of the best beauty subscription boxes and February's box is certainly a good one. The first thing that jumped out at me (wouldn't it be amazing if the products did actually jump out of the box when you open it?!) was the theBalm Cindy-Lou Manizer. In a previous Birchbox I received a similar sample of one of the shades from theBalm's How 'bout them apples cheek and lip set and I love it, so I'm very excited to try another product from the brand. I'm not 100% sure about the shade, I think Mary-Lou might work better for me, but it looks like a lovely product. The next thing to catch my eye was the Cynthia Rowley eye liner. I've never come across this brand before but a quick Google search revealed the brand includes fashion, beauty, eye wear and sports wear. The packaging is certainly very appealing, featuring black with gold writing and a gold dotted pattern, it's a compact size so easy to carry around and on first swatch the formula appears soft and creamy. 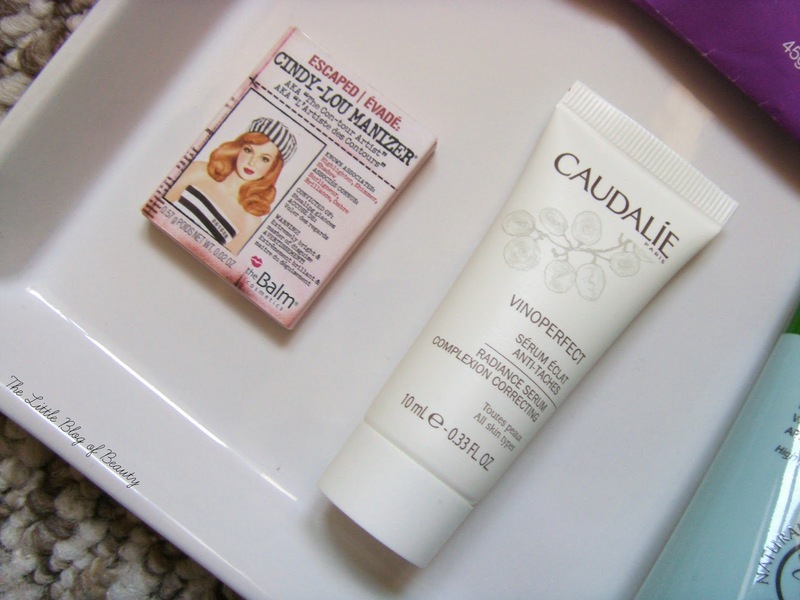 My eagle eyes spotted a Caudalie product lurking in the box and on closer inspection I discovered this is the Caudalie Vinoperfect radiance serum (10ml). I've already tried a sample of the day perfecting fluid from the Vinoperfect range, which I enjoyed using, so I'm looking forward to giving this a try. My eagle eyes also spotted Liz Earle in my box and I assumed it would be some kind of skincare sample, but it's actually the Liz Earle Botanical shine shampoo (50ml). I'm not sure I even realised that Liz Earle do hair care. This is plant based, SLS/SLES free and contains Vitamin E, Aloe Vera, Shea butter and apple and orange extracts. I'm a little unsure about the shea butter with my oily hair but it does say it's for all hair types so I'll see how I go. The last beauty sample is a T London Darjeeling hand & body lotion (50ml). It's not the most exciting looking sample, the packaging doesn't really appeal to me, but the lotion appears nice enough (the small amount I tried on my hand absorbed really quickly) and it appears to have a nice light citrus scent. 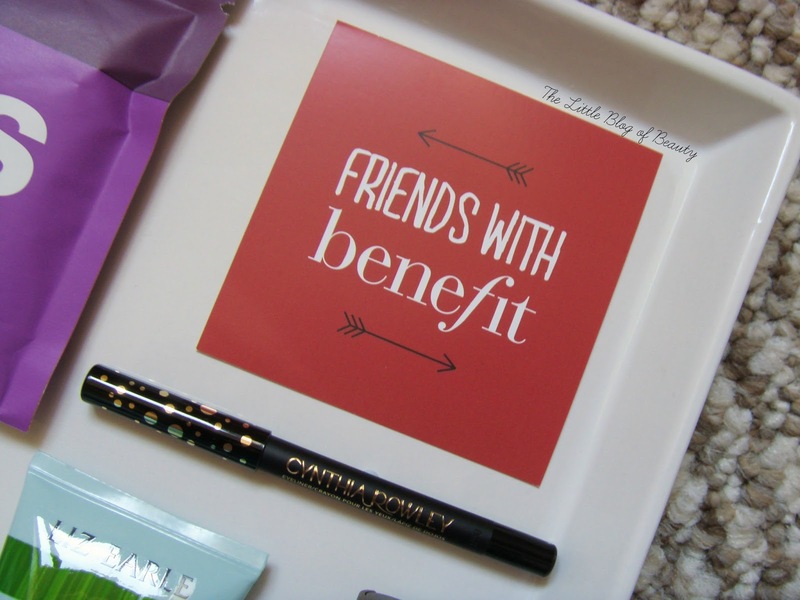 Finally if you're curious about the 'friends with benefit' card this is to let you know that the March box will feature a pick your sample selection from Benefit. At a guess with the recent launch of Puff off and the launch of Roller Lash on 26th February this might involve samples of the new products (or of course I could be completely wrong!). Birchbox is £10 a month plus £2.95 P&P however if you use code LOVEBB during February you'll get free postage for your first box. You can subscribe to Birchbox here. 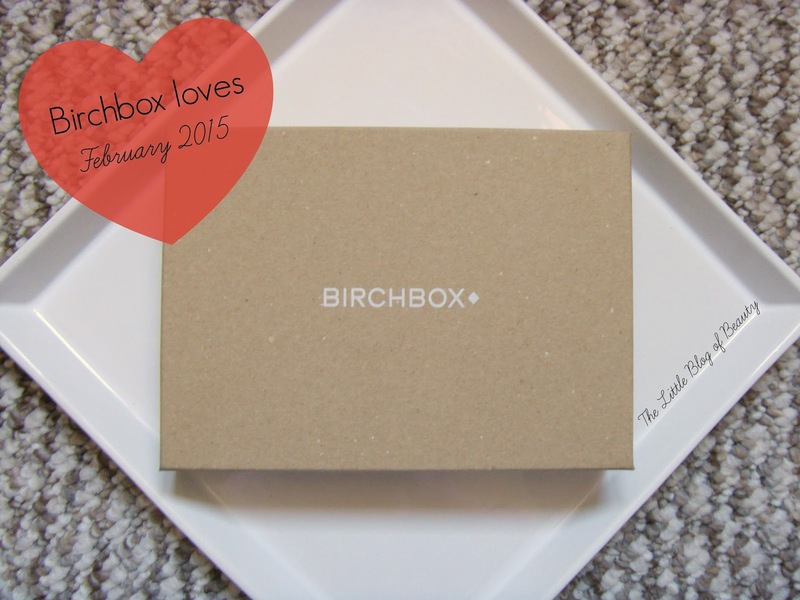 What do you think of the February Birchbox?